7-seater SUVs are becoming more and more popular with new models entering the market every year. Choosing the right one for your family might seem like an impossible task but never fear, our expert guide will not only cover the best 7-seater SUVs on the market, but will also explain the features to help you to decide which type of 7-seater suits your family and budget. With the extra legroom, headroom and storage space, SUVs appeal to a variety of drivers from the weekend surfer to the family of 7. Plus with the option of a four-wheel-drive or all-wheel-drive system, they can also offer better traction in unpredictable conditions and allow drivers to take on some of the harshest off road terrain. Even the cheapest car will become expensive over time. We all know a lemon that constantly breaks down will cost you thousands in the long run, but paying attention to the vehicles service schedule can bring significant savings as well. Many cars requiring servicing every 6 months while others stretch out beyond once every 12 months. The purchase price only tells part of the story of the total cost of your new car. You can now get delightful luxury features like self-heating leather seats and advanced safety features such as autonomous emergency braking on quite a few affordable brand new 7 seater cars.But, for many people, having a car isn’t a luxury or even a choice. A car is the only way to get their family from point A to point B daily. It’s a tool required for daily life. A new car is one of life’s biggest up-front expenses but the good news it that this is a purchase where you have total control over how much you spend. So how much should you spend on a car? This answer will vary from family to family so an honest look at your personal finances will give you a clearer idea of the amount you can spend without breaking the bank. One of the bigger breakthroughs in modern car safety, this technology is now available on even some of the cheapest cars on the market today. Many manufacturers have their own name for the technology however they all have a similar function, to stop you from hitting an object in front of you. Working via any combination of cameras, radar or lasers, if the car detects an imminent impact the car will automatically apply the brakes in order to safely bring you to a stop or at least decrease the severity of the impact. In many cars this technology is still an optional extra but in many people’s eyes, well worth the investment. Rear backup alert systems were introduced to warn a driver when the rear of the car is near a solid object that cannot be seen below the level of the mirror. Obstacles such as a parked car or a signpost, are picked up by the sensor and the driver is alerted by a beeping sound that beeps more frequently as the car moves closer to the object. These systems are parking aids, and in testing, Consumer Reports has found that they performed well for this function. However, in Australia, over 50 children are killed in reversing accidents every year. Parking aid systems are not enough to prevent this type of accident. Instead, be sure to check for a wide-angle rear video camera. This convenient feature could save a life in is fortunately now standard on all new passenger vehicles. Standard with almost all new SUVs is 6 or 7 air bags, including drivers knee & curtain airbags. Head-protecting side airbags are designed to keep passengers inside in the event of a rollover while also helping passengers to avoid side impacts from intruding dangerously into the cabin. Logic dictates that the more airbags the better! Electronic stability control is a feature controlled by the car’s internal computer that applies even pressure between brakes to prevent the car sliding sideways as can happen if the brakes lock. This feature is now mandatory on all new cars, including SUVs. If you decide to buy a used car, be sure to look for one that has electronic stability control to reduce the risk preventable accidents such as rollovers. The advancement in car safety features today is astonishing, Having the ability to monitor all sides of your vehicle, lane switching detection and collision early warning systems makes driving that much safer. Smart cruise control allows for drivers to sit back and cruise without much thought, AEB allows for reduced braking distances and improved stopping power. All this smart technology means the roads are a safer place. Though they may be higher and larger than your average passenger car, you no longer have to sacrifice size to save money on fuel. There are many new SUVs on the market with fuel consumption as low as 7.2 litres per 100kms. This is less than some standard family cars. When making your purchase, weigh up the purchase cost with the ongoing fuel costs. Especially if you’re covering a lot of kilometers every week. Now that you know what to look for in a 7-seater, here are our top 4 for your consideration. 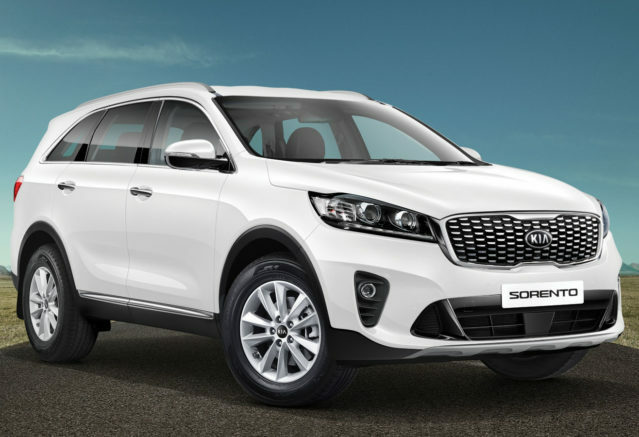 The Kia Sorento is one of the best handling and most comfortable large seven-seat SUVs on the market with one of the lowest fuel consumption records in the class. 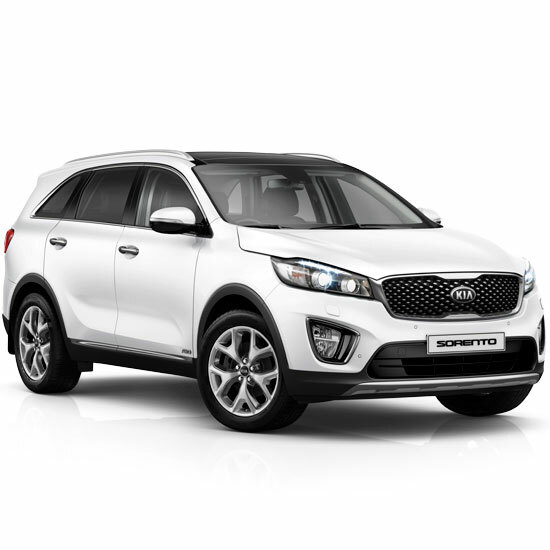 View our Kia Sorento range. 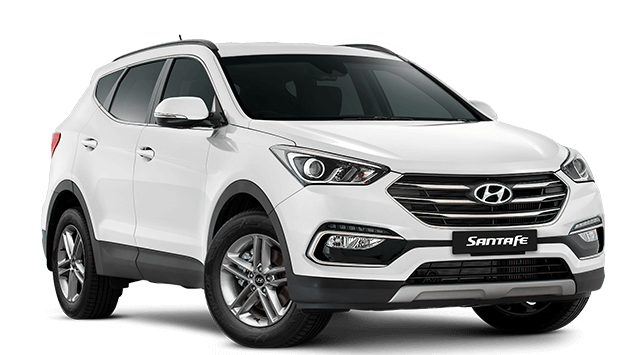 The value-packed Hyundai Santa Fe boasts great fuel consumption, space and comfort and is the stand out for affordability. 2018 Mitsubishi Outlander 7 Seater SUV – Space & Size! Room to move and then some, this 5 or 7 seater has your whole team covered. Available in 2WD or AWD the Outlander comes packed with advanced safety and entertainment features. 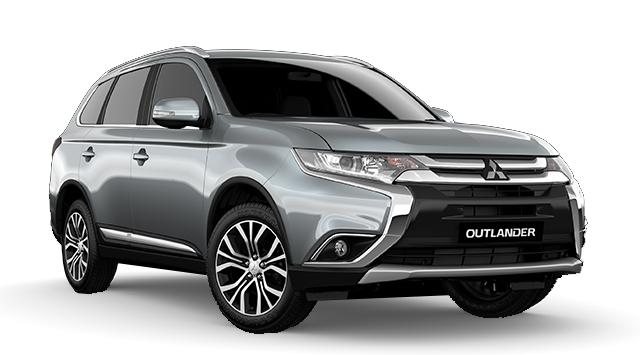 Safety first in Mitsubishi’s SUV innovation the Outlander. Packed with safety features that will give you peace of mind from forward collision detection to lane departure warnings even multi around monitor. The Outlander provides advanced safety features while remaining practical. 2017 Toyota Kluger Grande AWD – Great for kids! Spacious enough to seat 7 and still stow everything you need to get out on the open road, this car would suit the growing family who value safety as well as comfort. The Kluger has seven airbags, a reversing camera and rear parking sensors. Toyota Kluger, like all of our recommended 7-seaters received the maximum five-star safety rating from ANCAP. 2017 Mazda CX-9 – Wheels Magazine’s Car of the year! One of the most recently redesigned and finest looking SUVs on the market, the 2017 Mazda CX-9 has a unique combination of class, size and the style Mazda is known for. Powerful but with respectable fuel-efficiency, it may appear luxury and upscale but the price is accessible for most buyers. As you can see there are many considerations when it comes to purchasing your 7-seater SUV. Call (08) 9415 0000 today to talk to our sales team about our range of SUVs or email us through our contact page. We’ll be happy to answer any of your questions.